There are several food provision services across Cambridge, which aim to increase access to food for those that need it. We’ve compiled a few of these in the list below. If you or someone you know is struggling, please take a look at our Emergency Signposting toolkit for resources that can help. For more information on community food provision services, take a look at the Cambridge City Foodbank, the Cambridge Holiday Lunches Programme, or the Cambridge Food Cycle websites. Cambridge Sustainable Food partnered with The Edge Cafe, a community cafe and social enterprise, to install a community fridge. 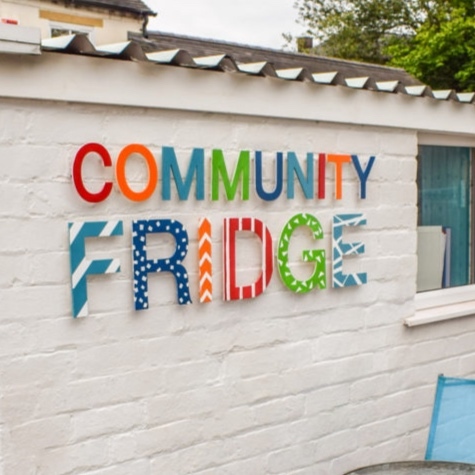 Community Fridges are a public space where organisations and households can make perishable food that would have been wasted available to the local community. So far, Community Fridges have helped thousands connect to their communities, access nutritious food, save money and reduce waste! Anybody wishing to donate should contact info@cambridgesustainablefood.org. The Fridge is open Mon to Fri 8am – 4pm and Sat 9am to 4pm. In 2016, the Cambridge City Foodbank distributed 4,552 three-day emergency food supplies to people in crisis. Run entirely by volunteers, the Cambridge Foodbank has six distribution centres across the city, with at least one centre open each weekday (Monday – Friday). You can visit their website to check current volunteering opportunities and register interest, as well as to discover other ways of getting involved. The Cambridge Holiday Lunch Programme provides free lunches during school holidays for families with children who ordinarily receive free school lunches. They usually run on several weekdays at various venues across Cambridgeshire during the school holidays (except Christmas when it is by invitation only). The programme is supported by Cambridge City Council, as well as a number of community organisations and churches. To find out more, take a look at the Cambridge City Council website. Cambridge FoodCycle takes surplus food from local supermarkets and groceries to cook free, delicious and nutritious meals for the local community, and in particular those suffering from food poverty. They currently offer 2 weekly community meals: one at Wesley Methodist Church at 12.30pm on Saturdays, and one as a family supper at 6.30pm on the first and third Wednesday of the month at Barnwell Baptist Church. Sign up to become a volunteer here.